Have you ever fantasized about being on Don Draper's couch or wished you could pull off one of Joan's stylish outfits? Would you give anything to walk the halls of the new Sterling Cooper Draper Pryce office? Well you might get your chance. Mad Men has launched an official eBay auction to benefit City of Hope. The item with the highest bid so far is a walk-on role in Season 5 (current bid $16,300). And now that Don Draper and the gang have new digs, the old office furniture is up for grabs including his couch (current bid $1,525) and desk (current bid $1,225). Or fans can try to win Roger's coffee table (current bid $2,800) and bar. Or if the show's fashions are more your thing, you might want to bid on an aqua evening dress worn by Betty (current bid $1,805) or a green office frock that belonged to Joan (current bid $830). There are also items that just about any Mad Men fan can afford including drapes from various sets including Peggy's office, Pete's office, and the conference room (current bids range from $20-$46). Also up or grabs a secretarial bullpen chair ($36) and a break room table ($50). 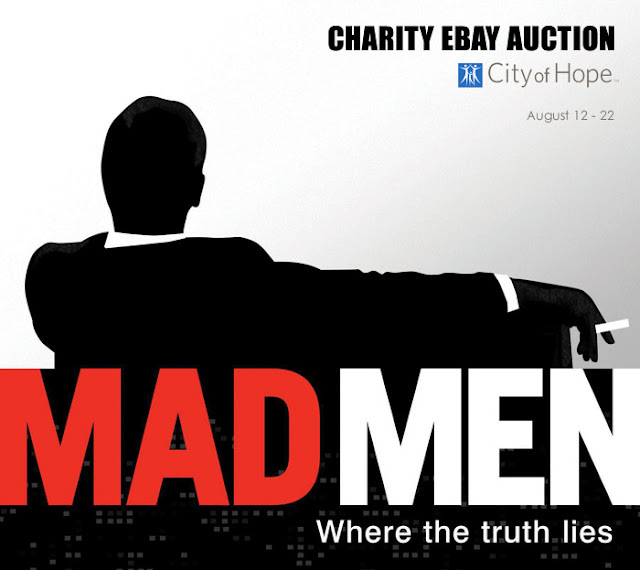 Don't miss your chance to own a little piece of Mad Men and help out a great cause. City of Hope, a medical institution known worldwide for its work to fight cancer, HIV/Aids, diabetes, and more.